At the end of January, when it’s still truly winter in the UK, on Mallorca spring already awakes with beautiful, sunny days and often pleasant temperatures between 15 and 20 degrees. 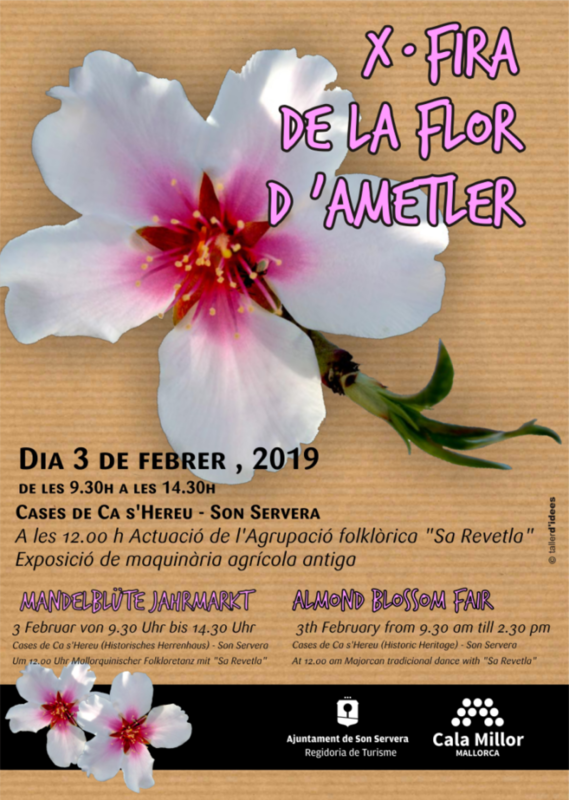 On Sunday, February 3, 2019, the “Firó de la Flor d’Amtler“, the traditional almond blossom festival, will be held in Son Servera. In the Cases de Ca s’Hereu you can learn how the almonds and the almond blossom are processed in Majorca. You can try traditional almond dishes, there are natural cosmetics, almond oil, perfumes and handicrafts. At 12 o’clock you can enjoy traditional Majorcan dances from the folklore group “Sa Revetla“.